On Oahu single family home sales were up 9.5% in June 2009 compared with June 2008, according to statistics from the Honolulu Board of Realtors. The median sales price is down from a year ago, $569,000 compared with $625,000. Lower home prices mixed with low interest rates and tax incentives could be the reason for the increase in sales for single family homes. There couldn’t be a better time to buy real estate on Oahu. For an in-depth look at what is selling on Oahu contact John Riggins. John Riggins can help you find the real estate you are looking for, whether it be in Ewa Beach, Kapolei or Ko Olina Resort. Take advantage of the Oahu real estate market today. It is no surprise to anyone’s ears that it is a buyer’s market when it comes to real estate and Ko Olina Resort is no exception. 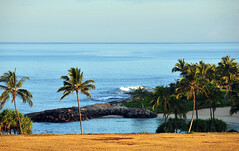 If you have ever been to the Ko Olina Resort on Oahu there is no doubt that you would want to return. Perhaps you even said to yourself “someday I am going to own a home here.” Well there could not be a better time to buy real estate in Ko Olina Resort. Not only is inventory up but prices are down. In this type of a market the buyer has a great deal of bargaining power. There are plenty of sellers that not only want to sell but they need to sell. If you are interested in looking at property in the Ko Olina resort area contact John Riggins today. John Riggins knows the market and can help your realize your dream to own the best real estate on Oahu. For more information about Ko Olina Resort Property as well as Kapolei Real Estate please contact John Riggins, Certified Distressed Property Expert. Click here for access to the Oahu MLS and all available listings in the Kapolei area.